The celebrations of Ram Navami start with the worship of Sun God. On the day, people wake up early in the morning, take bath and pay honors to Sun God. Thereafter, they would chant mantras of Lord Rama and offers fruits and flowers to the deity. The devotees of Lord Rama would observe a whole-day fast on the festival, which they would break only in the midnight, by eating a fruit. In many parts of India, satsangs are organized by cultural committees to commemorate the birth of Lord Rama. The congregation of the devotees would sing bhajans, chant mantras in the praise of the God and listen to the legendary stories. As a part of the celebrations, people would keep their home clean and decorate it beautifully. In the households where pujas are conducted, the pictures of Lord Rama, his wife Sita and brother Lakshman are hung. The devotees would offer flowers, burn dhoop and incense sticks. A thali used for the performance of the pooja would typically contain prasad and other items necessary for the ritual, including roli (sacred tilak), rice, lota (container filled with water), flowers, a bell, earthen lamp or deep and a conch. Everyone in a family takes part in the puja, which is conducted by the elderly member of the family. While worshipping the deity, songs are sung. When the puja is over, prasad is distributed among all the people gathered for the worship of Lord Rama. In many parts of India, typically South India, small idols of Lord Rama and Sita are worshipped in the households, which are take to a procession on the streets, in the evening. In many temples, Kalyanam' (a ceremonial wedding) is performed by the temple priests. Panakam, a sweet drink prepared by mixing jaggery with ginger and pepper, is a specialty of Ram Navami in southern parts of India. The dish is prepared as a prasad. It is first offered to the deity, and then distributed amongst the devotees. When the idols of the deity are taken to a procession, the devotees often play with water and colors, to mark the birth of the God. Tu hi hai Radha ka Shyam. tere charno me charo dham. es jag ke sare kaam. 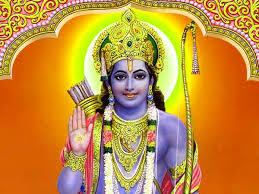 Ram charit varnan Karaun, Ramahin hridai manai. Man manoj lakhi kotihun Iajat. Maha nisha soi let bulai. Ramahi sundar rachi ras paga Math Durvasa nikat Prayaga. Ram nam nit bhajahu man. ratihun din chitlai. Karuna nidhan sujan silu sanehu janat ravaro. TuIsi bhavanihin puji-puni mudit man mandir chali.